A Jubilee pre 1903 as only two lamp sockets. The question is: what is the train and where is it? The hill in the background looks like Penmaen Head in North Wales so probably the train is an up Holyhead-Euston, maybe the Irish Mail. But this is guess work. One of the carriage men should be able to identify it. I suggest that the picture is taken before the line was widened west of Colwyn Bay, the hill in the background looks like Bryn Euryn, which is steepest on the southern face rather than Penmaenmawr which is steepest on the northern face where quarrying has taken place over the years, though there is the remote posssibility that it was taken from Llanfairfechan towards the Junction. At what date did quarrying start I wonder? The line was widened west of Colwyn Bay in the 1900s when the arch on the south face of the bridge was brought into use as a railway and was used to put in the extra track on what became the Down Slow and a large wall was built to support the earth. The location of the picture is probably Penrhos College bridge. I agree with Derek regarding the location. The date is probably April 4th 1900. The engine may well be Jubilee no. 1915 'Implacable' (the number isn't clear). The occasion being the return of the "empty" Royal train from Holyhead. The Queen's saloon is the 6th vehicle from the engine. (For further details see our book 'Holyhead's Royal Visit' published by Foxline). Both Derek Chaplin and Tony Robinson are correct. 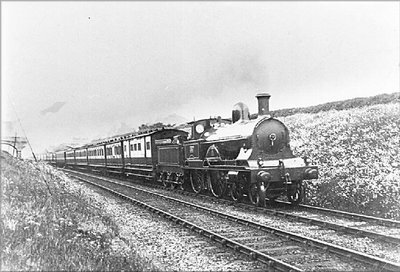 The mountain in the back ground is Bryn Euryn and this section of the main line west of Colwyn Bay was not quadrupled till 1904, as the Jubilee only has 2 lamp holders on the buffer beam, then Tony Robinson date of 1900 could well be correct. The stone arched bridge carried the main road from Colwyn Bay to Llandudno. I have the original photo. The loco is no. 1931 Agincourt. It is not the Royal Train. The sixth vehicle is a 12-wheel dining car. Thanks to all for identifying the location.